Are you looking for a good shampoo for gray hair which maintains the shine and glossiness of your gray strands? Whether you have gray hair naturally or by hair colouring, gray hair can be a little tough to maintain since they lose their shine and brilliance quickly if not taken care of. Metallic hair colours can look extremely stylish if they are maintained well and can make you look chic and stylish even if you do not style them every day. Having your hair dyed silver can transform your personality completely. If you are wondering which shampoo to use for gray hair, here are ten great shampoos that work well for gray hair and enhance their shine and vividness. A detailed buyer guide along with a few tips to maintain your metallic hue are also included at the end for helping you find a great shampoo to maintain your hair. Designed for reducing the brassiness and yellow tones developed in gray hair, this shampoo comes in a convenient plastic bottle with a flip-open cap. It has an FDA-approved formula and is used by many celebrity stylists as well. The formula contains coconut-oil compounds and keratin which reduce dullness and breakage. The formula helps to bring out the gray tones better in the hair and can be used to get as light or as dark hair as you want. It is not intended for daily use and lathers well. The shampoo is purple in colour so be careful when using it to avoid staining your fingers and skin. It has a mild fragrance which can be annoying for some users. Regular use gets rid of yellow tones and extends the life of your hair colour. The price of the shampoo is reasonable as compared to its quantity. The formula is designed to reduce brassy and yellow tones and enhance the metallic gray colour. It comes in a convenient packaging and the flip-open cap prevents spillage. The formula is very gentle on the hair and enhances the shine and colour of the hair. It extends the life of the hair colour and prevents it from dullness. The price of the shampoo is reasonable as one bottle lasts for 3-4 months if used weekly. The mild fragrance does not stay in the hair for long and the gentle formula lathers well. The purple formula tends to stain fingers and facial skin if used without gloves. The shampoo is not intended for daily use as it might be too strong on the hair. Using too much quantity and not rinsing the shampoo well can leave tiny blue spots on your hair. The flip-open cap does not close rightly and can leak the shampoo if not handled with care. This purple shampoo from Get Back Gorgeous is preferred by many celebrities for its wonderful and long-lasting results for gray hair. It enhances the colour and brilliance of the hair and prevents yellow tones from recurring as well. The price is also reasonable as compared to other gray hair shampoos. Made for blonde and gray hair, the Jenoris silver shampoo is infused with pistachio oil for nourishing the hair and protecting the colour. It has a purple formula which is designed to reduce the yellow and brassy tones of the hair to reveal metallic tones. The shampoo comes in a purple pump bottle and the quantity lasts for 5-6 months if used regularly. Regular use helps to make the hair look glossy and healthy without any colour fading. The formula is a bit strong and it does not contain any lathering agents to it is advised to use it carefully and sparingly to avoid blue streaks in the hair. The pistachio oil infuses the hair with Omega-3 fatty acids to improve strength and reduce breakage. The price of the shampoo is moderate and you can also buy multiple packs to get some discount. The formula is infused with pistachio oil which nourishes the hair well. Regular use highlights the silver tone of the hair and reduces fading of colour. One bottle lasts for half a year and the pump packaging is very convenient. The shampoo does not contain harmful lathering agents which dry out the hair. The formula is neither too thick nor too thin and coats the hair evenly. It is very gentle on the hair and does not weigh down the hair. The price of the shampoo is moderate as compared to other shampoos. The pump packaging leaks during travelling if not packed carefully. It is not suitable for daily use and does not lather like other shampoos. The fragrance of the shampoo is strong and can irritate the scalp. It is a great shampoo for blonde or gray hair and seals the colour with each use. Regular use helps to strengthen the hair and highlight the gray tones by reducing the brassiness and yellow spots. The quantity is good and the pistachio oil coats the hair with omega-3 fatty acids which prevent fading of silver and gray colours. Formulated with avocado, black current, and pomegranate seed oils, this shampoo is designed for dry and weak hair that cannot handle stronger shampoos. The main ingredients of the shampoo are guava and clover flower extracts which cleanse the hair without affecting the colour. The formula cleans the hair well and removes the excess oils and dead skin cells that cause the yellow tones in silver or gray hair. It also contains Aloe Vera, rosemary oil and orange peel oil which soothe the scalp and hydrate the hair. They also have anti-bacterial and anti-fungal properties. The shampoo comes in a pump packaging and the quantity is very good as compared to the price. One bottle lasts for approximately 7-8 months. Unlike other gray hair shampoos, the shampoo is white in colour and not purple. It has an herbal scent which is not very strong. The price of the shampoo is affordable. Guava extracts and nourishing seed oils are quite gentle on the hair and enhance softness. The quantity of the shampoo is very good and one bottle lasts for 8 months. The shampoo is not purple in colour and does not leave blue tones in the hair. The herbal scent is soothing and makes the hair feel fresh and clean after use. It efficiently removes excess oils and debris that make the hair look yellow. Aloe Vera and orange peel oil make the hair smell fresh and hydrated. The pump packaging requires some efforts to take the product out and is very bulky. The shampoo takes some time to work on the hair as it contains gentle ingredients. It dries out the hair if more product is used than required for cleansing the hair. It does not highlight the gray tones as much as some of the other shampoos available in the market. This is a very gentle shampoo formulated with natural ingredients that nourish and hydrate the hair while protecting the colour from yellow tones. It cleanses the hair well and absorbs the excess oil to give you clean and healthy gray hair without any heaviness or brassiness. The quantity also lasts for quite some time. Schwarzkopf is a well-known brand when it comes to hair care products and the color freeze range is designed for coloured hair specifically. It prolongs the life of the hair colour and contains semi-permanent colour pigments that improve the lustre and shine of the hair. This variant of the shampoo is designed for silver and gray hair and is suitable for both men and women. It is purple in colour and the quantity is more as compared to other shampoos. You only need a few dollops of shampoo for cleaning long hair so one bottle would last for 10-12 months if used once a week. The packaging is a bit inconvenient to use as it comes without a pump and is quite bulky. The price of the shampoo is quite affordable as compared to other variants but it is not available in smaller sizes so you have to purchase the 1000 ml packaging only. The formula contains special colour pigments to enhance the shine and brilliance of gray tones. The quantity of the shampoo is very good and one bottle lasts for a year or so. It is formulated using colour freeze complex which reduces fading and improves the life of the hair colour. The price of the shampoo is very affordable for such a renowned brand. It is suitable for both men and women and is specially formulated for gray and lightened hair. The formula lathers well and is quite easy to rinse completely. The packaging of the shampoo is very bulky and it does not come with a pump. The shampoo has a strong odour which can irritate the scalp if not rinsed well. It is not available in smaller sizes so you have to invest in the 1000 ml bottle. The colour of the shampoo is purple so it can leave blue streaks if left for more time than advised. This shampoo is used by celebrity hair stylists very often as it prolongs the life of the silver highlights and enhances the colour also using semi-permanent colour pigments. The quantity of the shampoo is very good as the bottle is huge. The affordable price makes it worth to try the product for silver and gray hair. With six variants to choose from, the Fanola No Orange shampoo is an anti-orange shampoo containing blue pigments which reduce the orange tones from gray or lightened hair. It comes with extra pigments to ensure that the brassiness and blonde tones which make the hair colour look dull and faded. The shampoo comes in a blue bottle with a standard cap and does not have a pump to take the product out. It is not free of sulphates which are not preferred by some users. The formula is moderately strong so it is advisable to not use it excessively. It takes some time to take out all the yellow and orange tones from the hair but provides long-lasting results. It has a soothing fragrance and leaves the hair soft and manageable. The price of the shampoo is affordable and the quantity is reasonable as one bottle lasts for 2-3 months. It is formulated to reduce orange and yellow tones from the hair and bring out the gray colour. The additional blue pigments enhance the colour and reduce fading to a great extent. The fragrance of the shampoo is soothing and lingers in the hair after wash. The price is quite affordable and the size options make it easy to try a smaller size. It lathers well and does not leave any residue in the hair like other shampoos. Regular use helps to soften coarse hair and improve the life of the hair colour. The packaging of the shampoo is not convenient as it does not come with a pump. The formula is a bit strong and cannot be used daily. You need to wear gloves while applying the shampoo to avoid staining. It takes some time to show the results for very light and gray hair. This no-orange shampoo makes it very easy to remove orange and brassy tones from gray and blonde hair. It acts only on the warm tones and leaves the hair colour looking highlighted with a glossy shine. The size options make it easy to try the shampoo as per your usage. Lush is a favourite brand of many people because of its natural products and cruelty-free formulas. This purple shampoo from the brand is a bestseller as it maintains gray hair without using any harmful chemicals. The shampoo has a thinner consistency as compared to other variants and is suitable for blonde and gray hair which need purple tones to counter the brassiness. The shampoo comes in a stylish black bottle with a flip-open cap. The quantity is reasonable as you do not require a lot of product to clean the hair well. The shampoo can be used for chemically treated hair as well as naturally gray hair and it does not cause any side-effects. It does dry out the hair a little in the first use but the hair regains the moisture in subsequent uses. The price of the shampoo is very high as compared to other gray hair shampoos available in the market. It contains purple pigments which enhance the gray highlights and reduces brassy and yellow colour. The packaging is travel-friendly and not bulky. The shampoo coats the hair well and has a thinner consistency which is easy to rinse. It is formulated with natural ingredients and without toxic lathering agents. The formula is suitable for chemically-treated hair also. The quantity is reasonable and the shampoo shows quick results. The price of this shampoo is very high as compared to other gray hair shampoos. It has a very strong fragrance which can be irritating for some users. The hair feels a bit dry when the shampoo is used for the first time. The instructions on the bottle come written in Japanese or Korean which can be hard to understand. This shampoo from Lush is a great option to consider if you are looking for a natural alternative to the purple shampoos available in the market. It is gentle on the hair and comes in a compact and convenient packaging. The formula is suitable for all hair types and works instantly in removing yellow and brassy tones from the hair. If you are looking for an affordable shampoo for gray and white hair, this shampoo from Dr. Fischer is one of the options you can consider. It is formulated with pro vitamin B5, almond extracts, chamomile extracts, and vitamin E to nourish the hair and slow down the fading process. The shampoo has a mild lavender fragrance which soothes the scalp and uplifts the senses each time you use the shampoo. Regular use makes the hair smooth and brings out the gray tones while reducing the yellow tones. It shows visible results from the first use itself and does not dry out the hair even with regular use. The shampoo comes in a standard bottle packaging with a flip open cap. It is suitable for natural as well as dyed gray hair. The price of the shampoo is affordable as compared to its quantity which lasts for about 4-5 months with regular use. The price of the shampoo is affordable as compared to its quantity. It has a smooth consistency and lathers well without leaving any residue. Regular use highlights the natural glow of the hair and makes them softer. The packaging is convenient and lightweight also for travelling purposes. The shampoo shows visible results from the first use and does not dry the hair. It is suitable for natural gray as well as dyed gray and white hair and has a soothing lavender fragrance. The purple formula can stain the fingers and the bathroom floor if nor rinsed quickly. The bottle does not come with a pump which could have added to the convenience. The formula is a bit thicker than other shampoos and can take some time to get rinsed completely. There are no size options available in the packaging. This shampoo is specifically designed using very soothing ingredients to add vibrancy and shine to gray hair without making them look ashy. It makes the hair feel soft and shiny and removes the entire residue from the hair that contributes to the brassy tones. The packaging and price is reasonable. One of the most affordable shampoos for gray hair, the Jhirmack silver ageless shampoo is formulated using macadamia nut oil which hydrates limp and weak hair to reveal their natural shine and colour. It also contains folic acid and green tea extracts which strengthen and repair the hair. Folic acid keeps the hair looking shinier as well as slows down the fading process. The shampoo comes in a purple bottle and the quantity is higher than other shampoos available in the market. The formula lathers easily even if you use a small quantity and does not leave any residue in the hair. The cap of the bottle is a little loose and can cause product spillage if not screwed tightly. The formula has a faint fragrance that is not very strong. The price of the shampoo is very affordable and you can also get some discount online. The shampoo is quite affordable and comes in a convenient lightweight packaging. Folic acid and green tea extracts work towards conditioning the hair and reducing fading. Macadamia nut oil nourishes the hair and adds a natural shine. The shampoo has a very faint scent which does not irritate the scalp. It is suitable for all types of lightened and gray hair and can also be used by brunettes. It rinses easily and does not leave any residue in the hair even if used regularly. The shampoo can leak from the bottle if the cap is not secured tightly. The macadamia nut oil can leave the hair feeling a bit heavy if used on oily hair. There are no size options available in this shampoo. Excessive use may leave the hair looking limp and weak. The Jhirmack ageless shampoo is preferred by many gray hair enthusiasts as it is suitable for daily use and is quite affordable as well. The shampoo cleans the hair well and makes the gray tones stand out by reducing the warmer tones. It also nourishes the hair well. 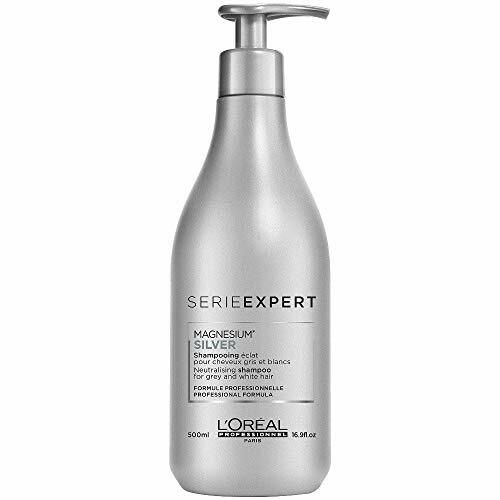 A neutralizing shampoo from the Loreal Serie Expert line, this shampoo is used by salons for its great results in a short amount of time. It is suitable for gray and white hair and has a purple-coloured formula to neutralize the brassy tones. The shampoo makes your hair look bright and feel soft from the first use itself and does not leave any purple or blue streaks in the hair. The dark purple formula requires gloves to be worn while applying it as it can stain fingers and skin. The shampoo is quite easy to use and creates rich lather from a very small quantity. The pump packaging is quite convenient to use and works well for travelling purposes also. The formula has a very pleasing fragrance which lingers in the hair and makes them feel clean and fresh. The price of the shampoo is very high as compared to other brands but the quantity is also more and one bottle lasts for 5-6 months. The shampoo neutralizes yellow tones from the first use and makes the silver and gray hair look more vibrant and shiny. The pump packaging is convenient to use and reduces chances of leakage. The shampoo has a very pleasing fragrance and the formula coats the hair evenly. The quantity of the product is more than some of the other shampoos available in the market. It creates rich lather from very small quantity and rinses easily without leaving any residue. It leaves the hair very soft and manageable after a few uses. The price of the shampoo is very high as compared to the quantity. It can stain the skin if gloves are not worn while applying the shampoo to the hair. The shampoo can leave the hair a bit limp if not rinsed properly. It can take some time to show visible results on thick hair. This shampoo neutralizes the warmer tones very efficiently and gives a salon-like finish to your hair after each wash. It might seem a little expensive but the instant results make it worth the high price. The soothing fragrance and the convenient packaging are some added advantages this shampoo offers. 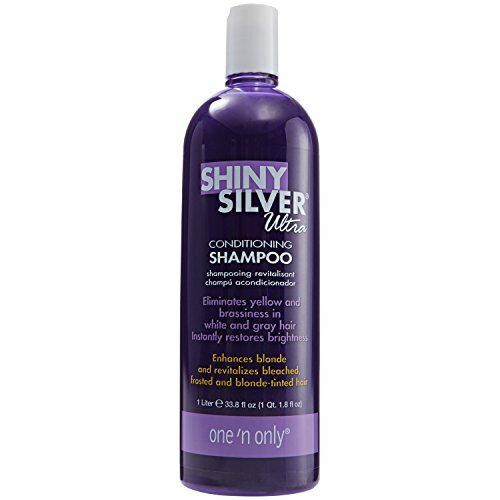 Made with tangerine, lemon, orange peel, and lavender extracts, the One ‘n Only silver shampoo is designed for dry and damaged gray hair and restores shine and vibrancy. The shampoo comes in a huge bottle and the quantity is a lot more than what other shampoo brands offer. One bottle will last for 5-6 months if used weekly. Apart from these natural extracts, the shampoo also contains hydrolyzed wheat protein which strengthens the hair and reduces hair loss. Honey helps to nourish the hair and improve their lustre with regular use. The formula lathers well in just a few minutes and is easy to rinse with a few washes. It does not leave any purple or blue tinge in the hair and highlights the metallic tones well. The formula is purple in colour and can be used with or without conditioner depending on how frizzy your hair is. The price of the shampoo is affordable as you get a lot of quantity at a reasonable price. It contains honey and hydrolyzed wheat protein to nourish and hydrate the hair. The price of the shampoo is quite affordable and the quantity is a lot more as compared to other gray hair shampoos. The formula does not leave blue streaks in the hair and has a pleasant scent. The natural extracts of lemon and lavender soothe the senses and have anti-fungal properties. The formula lathers well and does not leave residue in the hair after rinsing. The shampoo works well without a conditioner too if you do not have very frizzy hair. It contains a lot of chemicals that can damage the hair in the long run. Regular use dries out the hair if used on already dry hair without a conditioner. The bottle does not come with a pump packaging. The bottle dispenses more product than required due to a faulty flip cap. This shampoo uses natural extracts to cleanse and detoxify the hair and removes residue that causes brassiness. It offers a very good quantity at a reasonable price and has a sweet scent that lingers in the hair for quite some time after the wash. The use of hydrolyzed protein and honey rebuilds hair structure and conditions them. First of all, you need to determine your hair type and hair colour accurately before purchasing a shampoo. Keep in mind that a shampoo for gray and lightened hair is very different from a shampoo designed for brown and blonde hair. If you have dry or damaged hair, you should go for a hydrating and nourishing shampoo and if you have oily hair, you should buy a cleansing shampoo for gray hair. If you have any specific hair concerns, look for a shampoo that is designed to treat those hair concerns and keep your gray tones maintained at the same time. The way you have got your gray hair also matters when you are choosing a shampoo. If you have got naturally gray hair, it will not fade as much as coloured gray hair. If you have dyed your hair, it is important to be more careful as the colour can fade away quickly if you use a lot of product or wash your hair very frequently. Gray hair shampoos should be used sparingly and should be chosen depending on the origin of your hair colour. Another important factor to keep in mind is the nature of your gray hair. Whether you have global gray colour or gray highlights also plays an important role in selecting a shampoo. The formula of the shampoo should be gentle on the hair and should not dry or damage the hair in the long run. Look for natural ingredients that are beneficial for the hair and repair damaged hair. Most gray hair shampoos are purple in colour to neutralize the brassiness but some brands also make white shampoos which work equally well. Avoid buying shampoos which are laden with chemicals as these formulas can provide instant results but are very damaging for the hair. Read the label carefully to understand how often you can use the shampoo safely to avoid drying out your hair. Some gray hair shampoos can be used daily while some should be restricted to once a week to avoid getting blue streaks in the hair. Lifting the huge bottle of shampoo and flipping it to take the product out can be a daunting task when you are standing in the shower. Go for a bottle with a pump packaging if the quantity is more than 500 ml. these bottles are much more convenient to use and do not result in product spillage. You can also go for flip open caps but avoid screw caps as much as possible. If you need a shampoo for travelling purposes, go for a smaller and compact bottle for ease of use. If you cannot find a smaller packaging, you can also buy travel bottles and pour the required amount of shampoo into the bottle for travelling purposes. Gray hair shampoos are generally costlier as compared to normal shampoos as they are designed to enhance the metallic tones and reduce the yellow look that develops in gray hair after a while. You can get a good shampoo for gray hair in around 15$ to 30$ depending on the quantity and the brand. Avoid buying very cheap shampoos that claim to provide instant results as these formulas use strong chemicals to suppress the brassiness. These chemicals can cause your hair to get dry and dull after a few uses. You can buy multiple bottles of the shampoo that works well for your hair to save some extra money. Look online for discounts and deals on your favourite shampoo and stock it up when the prices seem reasonable. It is essential that you read all the customer reviews for a product before purchasing it to get an idea of how efficient it is in handling gray hair. These reviews will help you make a choice more easily and will also solve any concerns you have regarding the formula or the results. You can also post some of your queries on the consumer section to get help regarding the shampoo. Do not forget to add your own review on the page after you have bought and used the product to help fellow users. Q: Why does gray hair turn yellow? A: Since lightened or gray hair contain fewer pigments than brunette or dark blonde hair, they take pigments from the environment or the products used on them and turn yellow in the process. Most shampoos are yellowish in colour and can deposit their pigments on the hair if used regularly. This causes white or gray hair to turn yellow in the long run if the right shampoo is not used for washing them. Q: Can gray hair turn ashy if not washed regularly? A: If you have dyed your hair gray and they are not gray naturally, your hair can turn ashy as the artificial hair colour fades and reveals the natural hair colour. Routine maintenance and touch-up is required for coloured hair to maintain the vibrancy and colour of the hair otherwise they begin to look dull and ashy. Q: Can exposure to the sun cause gray hair to turn brassy? A: Over-exposure to the harmful rays of the sun can bleach the gray hair and make them look yellowish and brassy. Gray hair contains fewer pigments so they are also more susceptible to sun damage than dark hair. Exposure to sun can be avoided by covering your hair when you step out in the sun or by using a hair protection serum after washing the hair. Q: How often can I wash gray or lightened hair? A: You can wash your hair as often as you see some discoloration or fading. Some shampoos are gentle enough to be used daily while some should only be used once or twice a week to avoid staining. Washing hair too often can take away the natural moisture and make the hair look dry. If the shampoo is advised to be used daily, dilute it with some water or apply it on targeted areas only. Q: Should I use a conditioner along with a shampoo for gray hair? A: There are special conditioners and hair masks formulated for gray hair which can be used with purple shampoos for cleaning and nourishing your hair. Go easy on the conditioner if you already have oily hair as this can weigh down the hair and make them look greasy. Q: Why are most gray hair shampoos purple in colour? A: Purple colour is used to colour-correct warmer tones and this is the reason why shampoos for gray hair are purple in colour. It is the opposite colour for yellow on the colour chart and neutralizes warmer colours to reduce brassiness. This is why people with blonde or lightened hair are advised to use purple shampoos for color-correction. Q: Should I use purple shampoo on dry or on wet hair for better results? A: This depends on how much toning your hair needs. Applying a purple shampoo on dry hair leads to better colour absorption and more intense highlights while using it on wet hair gives a gentle toning and colour correction. You can use the dry technique once in a while to get better colour but use the wet technique for normal hair washing routine. Q: Can excessive usage of purple shampoo turn the hair purple? A: It can add a subtle tint of blue or purple to your hair but none of the good purple shampoos make your hair turn purple if you use them for the required amount of time and rinse them properly. It is mainly designed to add more shine and vibrancy to gray hair so it does not leave the hair purple if used the right way. Q: What happens if purple shampoo designed for gray or lightened hair is applied on darker hair? A: Purple shampoos are only designed to work on neutralizing yellow and other warmer tones. If you apply a purple shampoo on darker hair, it will not have any drastic effect on the hair and will not cause any toning also. You can use a purple shampoo easily on highlighted hair if it is gentle enough for daily use. Q: Do these shampoos give instant result? A: If you use the shampoo correctly, it should show instant results. You will see some color-correction and toning immediately after rinsing and drying your hair. If you do not see results, it might be possible that you are using lesser product than required or are not leaving the shampoo for enough time on the hair. If it is a gentle formula, it might take some time to show great results but will still show visible results from the first use itself. You can experiment with the colour by increasing or decreasing the amount of shampoo you use for washing your hair. More shampoo will give you more colour and vice-versa. Keep your hair protected from excessive exposure to the sun rays by covering the hair with a scarf or a hat when stepping out in the sun. You can also use a serum to protect your hair. Always apply the shampoo from the roots to the tips if you have global hair colour. Apply only to the necessary areas if you have gray highlights. Use a clarifying shampoo before using a purple shampoo if you have a lot of residue built-up in your hair. Leave the shampoo on the hair only for the time advised on the bottle. Do not leave it for more than 5 minutes if you are avoiding excessive colour correction. You can use any conditioner with a purple shampoo but it is recommended to use a purple conditioner for locking the colour. Use a hair mask once a week to protect the colour and nourish the hair properly. The amount of colour your hair absorbs depends on the porosity of the hair to use the shampoo carefully when using it for the first time. Wash the hair with a clarifying shampoo again if you feel that your hair has more purple or blue tones than you desire. This will tone down the colour. Dilute your shampoo with water if the purple dye is too strong or dark to get subtle colour and highlight your gray hair more naturally. Do not use purple shampoo with fake hair or hair extensions as the chemicals in the shampoo might react adversely with the glue and damage your extensions. Use a sulphate-free purple shampoo for washing and toning curly hair as curly hair can get damaged if exposed to sulphates regularly. Do not use a purple shampoo for brunette hair as it will show the desired colour correcting results and will just make the hair look dull if used regularly. Gray hair can also get discoloured with continuous exposure to chlorine in water so keep that in mind while using the shampoo. So these were the ten best gray hair shampoos which work well for all types of gray and lightened hair. These purple shampoos neutralize brassy tones very well and reduce fading significantly if used correctly. The detailed buyer guide along with FAQs and tips will help you find the right type of purple shampoo for your gray hair to add more vibrancy to your hair colour. Regular washes with these shampoos will help you get beautiful gray hair easily without any high maintenance. Keep the tips in mind while using the shampoo to get lustrous and shiny gray hair. Have you used a shampoo for cleansing gray hair? Which is your favourite shampoo? I wonder why grey hair have different texture? Because there is less sebum, drier and rough when you are older. Moreover, the constant can twist your follicles and more crinkly hair. To keep your grey hair healthy is to use a low setting on hair dryer and don’t pull your hair and use olive oil. I suspect that why grey hair turn yellow? The reason is grey and white hair don’t have the pigment. It show the colors of materials that receive from water or pollution such as air and smoking. I’m addicted to Jenoris Silver Shampoo. I choose Fanola No Orange Shampoo. Let’s try together.